It turns out, you might need to take a look at in-demand careers. If you choose the right career training program, you can land a job that pays well and rewards you with personal fulfillment, too. 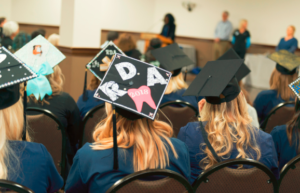 Even if you need to look beyond your current degree to other training, your education wasn’t a waste. You can apply what you learned in college, or even in high school, to a new career. If you’re a problem-solver, a multi-tasker, and you like working with people, becoming a dental or legal assistant is a sensible choice. It’s a fun, rewarding career that’s new and different every day. 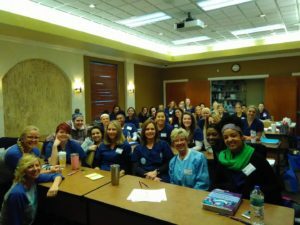 You’ll be a valuable part of your dental practice as a cross-trained dental assistant, and you’ll be making your community better, every day. What more can you ask for? If you want to make a difference in the world, healthcare is the right field for you. It’s practical, it’s in high demand, and people rely on it every day. It’s time to move forward and find your own path. It’s time to make a positive change for your future, with the Dental Staff School. An interview is the short span of time spent with each other, in which a person has to decide whether the employee is perfect for the job or not. To establish this, the ‘interviewer” asks several questions. Keeping in mind there are different people who may interview you throughout the hiring process. Ex. The dentist, office manager, or a company hired by the dental office and or personality test. Certain questions are quite simple and can be answered immediately, while some are not as simple and require some thought before the answer is given. One good example of this is the question regarding strengths and weaknesses. Perhaps you’re incredibly organized. Or, you might excel at motivating people, helping resolve disagreement, or researching hard-to-find information. I enjoy challenges and figuring out new tasks/projects, then getting good at them. I am very motivated and driven, very honest and hungry to keep learning. Whatever your strengths, you have something valuable to offer. Find a role within your team that allows you to do what you do well. This will help you make a meaningful contribution – and increase your chances of doing a great job. Plus, it’s usually much easier, and more satisfying, to do tasks when you’re naturally good at them. Research shows who will perform well and succeed in a new job is the one who possesses ability to learn quickly and the one who can adjust himself/herself to changes and new situations. Also, effective interpersonal communication skill is one of the best personal traits. To achieve success, one needs to be self motivated and determined to succeed. All companies search for an individual who has the drive within himself or herself. But how, exactly, do you go about showing that you’re a team player during a interview? You could explain your commitment of meeting goals or deadlines. During previous work or school you were the one other team members depended on. One should avoid gossip, politics, and religion. Showing appreciation of other members of the dental team. Team players should work on having diversity, attitude, and being candid. Several interviewers will also ask whether you have any weaknesses. When it comes to weaknesses, make sure that you describe the weaknesses that are vague enough to be converted into strengths. Lack of some skills: No person has all the requisite skills for the job profile. There are some people who have become introverts because all we do is text and email. Remember communication if key for a good employee so I would pick another topic or ways you are improving your verbal and communication skills. Hope this helps on your next interview. 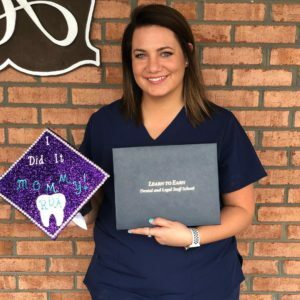 A dental assistant’s duties include hands-on work with dental patients, assisting the dentist, and/or performing clerical functions in a dental clinic. Depending on an individual’s certification and goals, any of these are possible job tasks. If an individual would like hands-on work in the dentist’s office, their duties may include prepping the patient for a particular operation; this particular duty would involve knowledge of the teeth and most dental procedures. 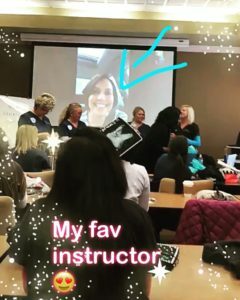 The dental assistant would then assist the dentist in performing the procedure, and do such things as handing the dentist the required instruments. Becoming a dental assistant usually involves working one-on-one with the dentist, requires the ability to multi-task and has excellent communication skills. 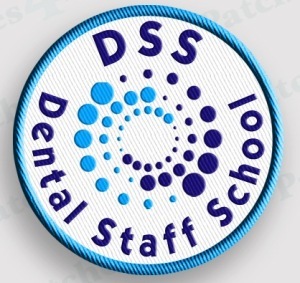 Enroll today, for a dental career, at the Dental Staff School. Women encompass the majority of Dental Assistants in the United States. Individuals in this line of work make around $14.00 per hour on average graduating from the Dental Staff School. 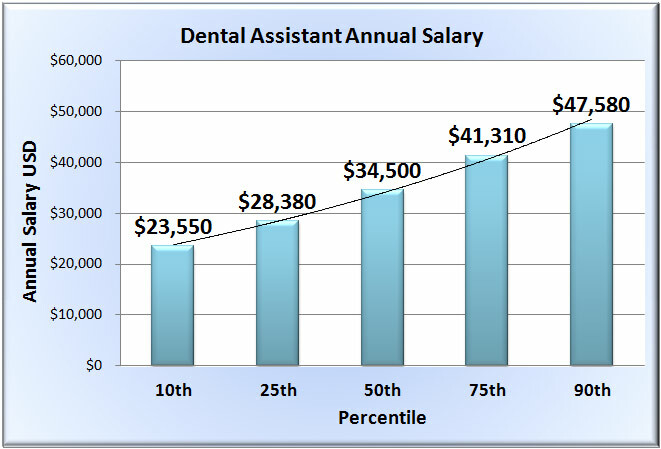 Total cash compensation for Dental Assistants runs from $22K to $43K depending on your location, career path or specialty. Job satisfaction for Dental Assistants is high. Medical benefits are awarded to over a third, and just over two-fifths earn dental coverage. The information for this rundown comes from respondents who completed a Dental Staff School salary questionnaire.